The Cyclones provide the ultimate in comfort and style while you look your best as you workout and improve your performance. Antifungal and antimicrobial Iowa state sports performance socks stay snug while you run improving your circulation and blood flow, assisting in the prevention of leg pain, swollen legs, sore feet and fatigue after a workout. donegal bay Cyclones sports performance socks stay snug during your workout helping prevent blisters as well as foot and leg cramps while they aid in refreshing your feet and legs. 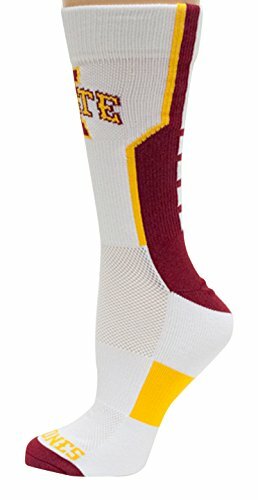 Support the Iowa state Cyclones while you improve your performance sporting your crew length donegal bay Iowa state sports performance socks available in different fashionable styles and colors. Made with hygroscopic polyester and spandex materials and a reinforced heel. Official Iowa state jacquard woven logos and colors. Manufacturer: Trickeration Inc. DBA Donegal Bay Ltd. Publisher: Trickeration Inc. DBA Donegal Bay Ltd. Studio: Trickeration Inc. DBA Donegal Bay Ltd. If you have any questions about this product by Donegal Bay, contact us by completing and submitting the form below. If you are looking for a specif part number, please include it with your message.